All is gloom in the bee yard these days. We had been so hopeful. Remember in my last post how I bragged we’d found only 4 mites in Betty? We thought surely the formic acid pad on Veronica knocked down her mites as well. After all, we treated Veronica with formic acid twice; Betty only once, and then only for a few hours a day. Poor Veronica! Twice she lived with formic acid day and night for three weeks—once in mid December, then in late January. And yet, a week after removing the formic acid from Veronica, what do we find? 102 mites stuck to the sticky board after a 24-hour natural mite drop. And worse, a powdered-sugar dusting that same day yielded 132 mites in 10 minutes! Aye, Veronica! But weak little Betty, the hive who had such trouble building up last summer, seems to be holding her own against the mites, with only 5 mites dropping 10 minutes after a powdered-sugar dusting. We’re confounded. We don’t know what to do. We have been advised: Tear apart Veronica’s boxes immediately, kill any brood we find (the idea being that there shouldn’t be much egg laying going on this time of year), shake the bees into one box with some honey and treat them again with formic acid. Sterilize the empty brood box. Ihate this idea. I’ve been doing some reading about beekeeping alternatives, and I tend to agree with the biodynamic beekeepers who try to preserve the unity, or the “bien” of the colony. Since the first time I went into a hive, I’ve thought of the hive—the girls, the queen, even the much maligned drones—as a single, complete organism. You know, like an animal. I often describe the hive to my friends as a tiger in a box. To cut poor Veronica apart and invade her “body” seems horrific to me. Still, I suppose radical surgery is often necessary. We’re discussing it—really, we’re having a dispirited argument. Treat? Or don’t treat? It’s a huge controversy. But we’re going to have to make up our minds, as time is drawing short. Queen Veronica will soon be laying frames of eggs, if she isn’t already. We’re discussing other ways of raising bees, and are thinking about getting a top bar hive in addition to our two Langstroth hives. This is controversial in itself. And we’re researching small cell retrogression. 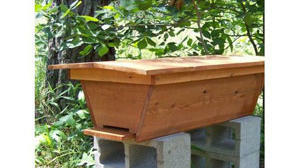 Readers, do any of you have personal experience with top bar hives or alternative beekeeping? Comments, please!